Mirror file photo by Gary M. Baranec Visitors enjoy the Blair County Arts Festival on the grounds of Penn State Altoona last year. The Blair County Arts Foundation is taking a “step back” from the festival next year. The festival will go on as scheduled this year — May 18-19 — but will not be held in 2020. 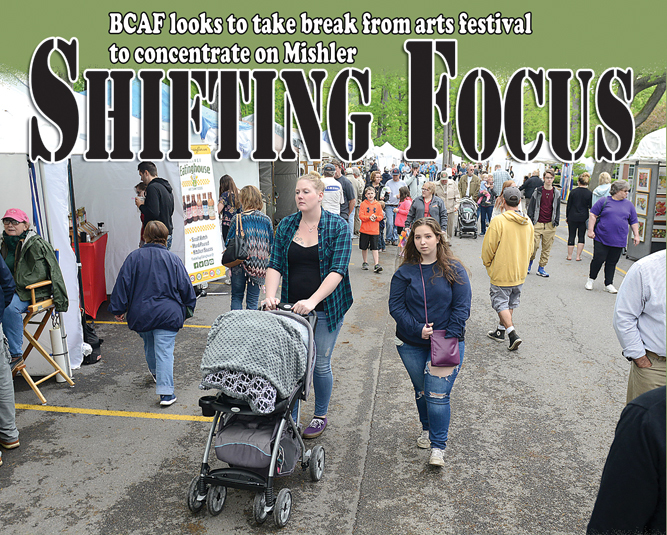 A retirement announcement by a longtime Blair County Arts Festival organizer/Blair County Arts Foundation employee has prompted the foundation’s board of directors to “take a step back” from the 52-year creative and performance arts celebration and refocus efforts on increasing the Mishler Theatre’s use. Both Jonathan O’Harrow, Blair County Arts Foundation president, and Kate Shaffer, executive director, emphasized that this year’s festival isn’t expected to be the last. Instead, the festival will take a year off in 2020 to allow for an organizational transition and to refocus on filling the seats in the Mishler Theatre. For nearly half of the festival’s 52 years, Karen Volpe, 67, of Altoona has spearheaded the festival — first as a seven-month subcontractor. Eventually, she was hired full time and added theater responsibilities such as scheduling shows, drawing up leases and as a liaison with tenants. She plans to retire May 31. The arts foundation has spent years and nearly $3 million in grant and donated funds to refurbish, restore and modernize the historic theater. When it opened in 1906, the Mishler Theatre had the distinction of being the first structure solely devoted to theatrical pursuits in the nation. At that time, most theaters occupied second floors in commercial buildings. In its early days, George Burns, Sara Bernhardt, Lillian Russell and Helen Hayes graced the Mishler’s stage. In 1965, the Blair County Arts Foundation, together with Altoona Community Theatre, raised $47,500 to purchase the Mishler Theatre from the Notopolous family, in order to prevent its demolition. So, the board advertised for the new, full-time position of theater manager and received 60 applicants. The board narrowed the field to four candidates who were interviewed, Shaffer said. “And we are thrilled that we reached a unanimous decision. We will welcome the new theatre manager on June 1,” Shaffer said, but declined to name the person until a later date. While the duration of the hiatus is flexible, O’Harrow said the board’s intention is to bring it back. In addition to Volpe, 15 members of the festival committee work all year on the event and are joined on the festival weekend by 150 to 200 volunteers. About 10,000 people gather on the campus of Penn State Altoona to watch ballet performances, listen to various types of music, browse art exhibits and shop for unique, hand-crafted treasures. The Blair County Arts Festival is sponsored in part by the Pennsylvania Council on the Arts. BCAF is a member of Explore Altoona.